Tessellation is the process of covering the plane with shapes without gaps and overlaps. Tiles on walls and floors are the most common tessellations. In this post, we are going to prove that the there are only three regular polygons that can tile the plane. Tiling the plane with regular polygons is called regular tessellation. These are equilateral triangles, squares, and regular hexagons. This proof only requires simple algebra. We will use the notation , where is the number angles of the polygon and is the number of vertices that meets at a point. For example, a square has four angles, and at every point on the tessellation, four vertices meet at a point. So, we can represent square as . Another example is the regular hexagon. A hexagon has 6 sides, and at every point 3 vertices meet (see figure below), so a hexagon can be represented as . 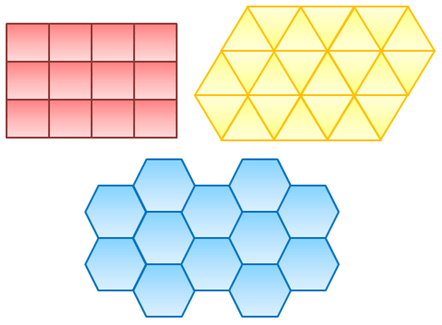 Theorem: There are only three polygons that can tessellate the plane: equilateral triangles, squares, and regular hexagons. We know that the angle sum of a polygon is where is the number of angles (or sides). This means that each angle has measure . For example, pentagon has 5 angles. Then, the angle sum is . Now, to get the measure of each angle, we divide by (the number of sides/angles) and this gives us degrees. Now, notice that to be able to tessellate without gaps or overlaps, the measure of the angle of each vertex times the number of vertices that meet at a point is equal degrees 360 (Can you see why?). and the number of vertices that meet at a point is . Notice that the only possible values to get a 4 is (4)(1), (2)(2), and (1)(4). Using the representation above, Case 1 which is is an equilateral triangle, Case 2 which is is a square, and Case 3 which is is a regular hexagon.